A marine ecology expert says it could take an international effort to manage the amount of debris and pollution that washes up on Rottnest Island. Southern Cross University National Marine Science Centre Associate Professor Stephen Smith conducted a study into the patterns of marine debris on the iconic island. The project involved 40 volunteers searching for debris at 16 different sites around the island over five days. In total, 4520 items of marine debris were documented, 73 per cent of which were plastics, 10 per cent were glass, and six per cent were metal. These items were analysed using univariate and multivariate statistical analysis methods to determine patterns of distribution types and proportions of items deposited locally. "We have to look at the bigger picture which is bigger than RIA; it's more of a state-wide approach," A/Prof Smith says. "It could even be if this stuff is drifting in from elsewhere so it could be a national or international issue. "We've got to have a look at things like what are the processes generating this debris, how far has it come, can we do something about those source areas to reduce the amount that actually comes on to the island?" A/Prof Smith says plastic debris is most concerning because it can be mistaken for food items and be ingested by birds. Researchers expected to find most of the debris in the north-eastern sector which is densely populated and closest to the mainland, but this hypothesis was disproved. "We found by far the majority of the debris, and these were primarily fragments of plastic, could have come from quite a long distance but could have also been generated locally," A/Prof Smith says. 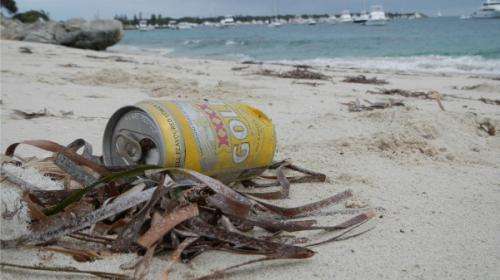 Researchers found more items were left on the beach in the north-eastern sector as opposed to being washed up in other locations. "I guess that's a bit of a no-brainer but it's an important finding because in terms of converting that into management objectives, more patrols, more signage, more checking that people were doing the right thing would be an effective way of reducing the debris in the north-eastern sector," he says. A/Prof Smith says the next step is to educate people like fishermen who may not be aware of their actions impacts. A/Prof Smith says similar work done on Australia's east coast has helped them discover debris with non-English writing, prompting them to question sources of marine debris. The coast of the Island is about 35km long, that gives an average of 129 pieces of garbage per/Km. It's a popular tourist spot receiving around 500,000 visits per year, it is also only 18Km from Perth/fremantle, a city of 1.6 mil. The Swan river, runs through the city and discharges almost straight at the Island. I think a closer study of the garbage in question is warranted. It's worth looking at the Swan river and perth/Freo shoreline also. Save the Quokka's!